INTRODUCTION: Single incision laparoscopic surgery (SILS) is an emerging surgical technique with potential for improved cosmetic and functional patient outcomes by reduced abdominal wall trauma with a transumbilical approach. There is currently limited data on the early outcomes and learning curve with SILS. METHODS AND PROCEDURES: Prospective data was collected from5 surgeons performing SILS in 3 Canadian institutions. All surgeons underwent a clinical proctorship and/or a dedicated skills course comprising lectures, and animal lab training prior to performing SILS procedures. Operative data, inpatient complications and follow-up data were recorded. RESULTS: 35 patients underwent SILS procedures between March and September 2009. 20 patients had elective procedures (9 cholecystectomy , 5 colonic resection, 3 partial gastrectomy, 2 nephrectomy, 1 splenectomy), while other 15 patients had SILS procedure during an emergency surgery (12 appendectomy, 2, small bowel procedures, 1 cholecystectomy). 8/35 cases (23%) required additional port placement and one case was converted to open surgery. Mean (range) operative times were 52 (28-75) minutes for appendectomy, 78 (47-138) minutes for cholecystectomy and 95 (77-135) minutes for partial colectomy. There were no operative complications or patient deaths. One patient suffered postoperative pulmonary embolus and there was one wound infection. 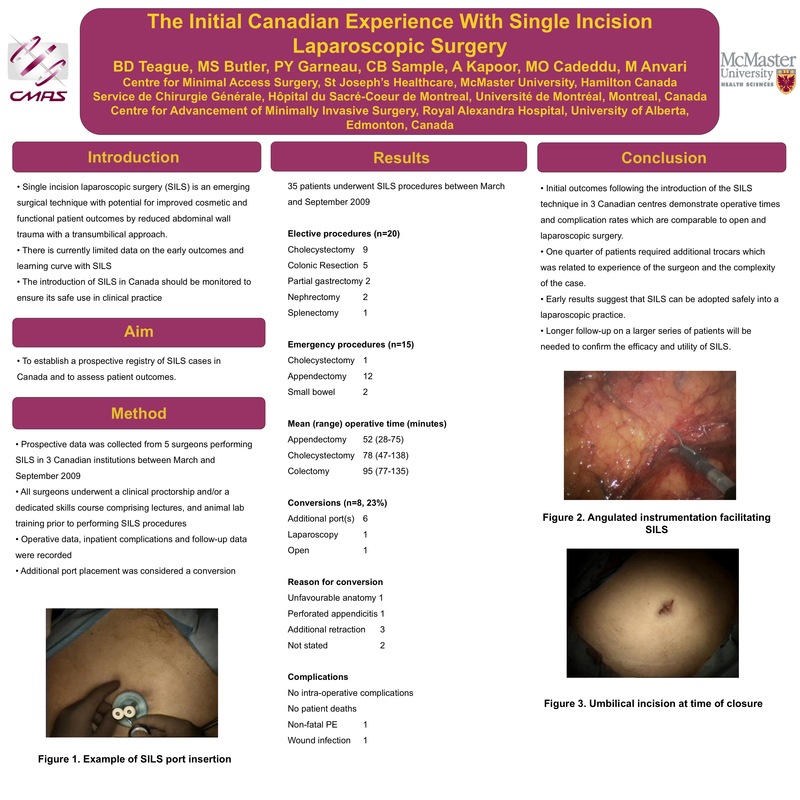 CONCLUSION Initial outcomes following the introduction of the SILS technique in 3 Canadian centres demonstrate operative times and complication rates which are comparable to open and laparoscopic surgery. One quarter of patients required additional trocars which was related to experience of the surgeon and the complexity of the case. Our results suggest that SILS can be adopted safely into a laparoscopic practice. A longer follow-up on a larger series of patients will be needed to confirm the efficacy and utility of SILS.